1. 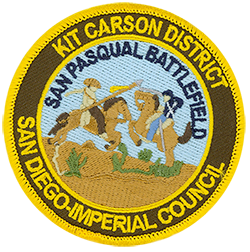 Visit the San Pasqual Battlefield State Park while in uniform. 2. After viewing the video “Mr. Polks War,” at the visitor’s center and talking with the park’s interpreter/docents, answer the following questions. A. What was the term that was circulating around the United States that describes the idea that the country was supposed to eventually be one nation, from coast to coast? B. When did the war with Mexico begin? When was the Battle of San Pasqual? later serve as a California state senator? what way could the American dragoons claim victory? F. After the battle, the American army dragoons eventually ended up on a hill near the Westfield Mall and Interstate15. What name did they give that hill and why? encircled hill position and made their way to San Diego to get reinforcements from Commodore Stockton? H. Explain Kit Carson’s contributions to General Kearny and the Army of the West. governor of California over that of John C, Fremont. I. Why were Stephen Watts Kearny’s actions in California important to the stability of California? miles west along highway 78. What is written on the plaques? 4. Submit your correct answers and the following form to one of the volunteers at the desk of the battlefield park’s visitor’s center with your answer sheets and $4.00.